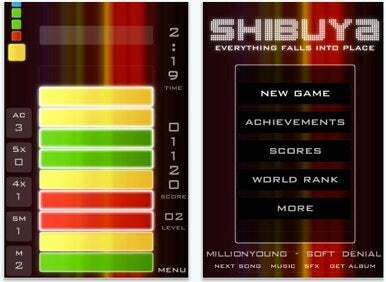 Indie developer Nevercenter has released its award-winning arcade puzzle game, Shibuya, for iOS. Inspired by the bright lights and myriad arcades of Tokyo’s Shibuya ward, Shibuya’s deceptively simple, addictive gameplay earned it a win at this year’s PAX 2010 Indie Showcase in Seattle. Gameplay consists of the player sorting colors from a side bar by assigning them to a stream of constantly falling empty blocks, and then tapping matched groups of colored blocks to remove them. The goal is to prevent the blocks from stacking to the top of the screen. More experienced players can plan extensive combos and match up large groups of color for maximum points. It’s a simple-enough premise, but like any good arcade puzzle game, Shibuya requires increasing amounts of strategy, foresight, and reflexes to achieve higher scores. Shibuya includes two gameplay modes and five speed classes that let you customize the game’s difficulty. It also features online rankings, achievements, and the ability to see friends’ scores via OpenFeint. Shibuya costs $2 and runs on iOS 2.0 or later. Check out a clip of the game in action, below.